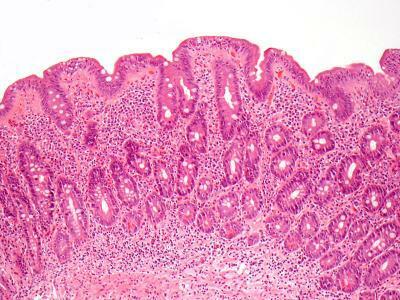 Celiac disease who had persistent intestinal damage - identified with repeat biopsy - showed a higher risk of lymphoma than patients whose intestines healed, according to a new paper. Celiac disease is an autoimmune disease that affects up to one percent of individuals in Western nations and is characterized by damage to the lining of the small intestine that, over time, reduces the body's ability to absorb components of common foods. The damage is due to a reaction to eating gluten, which is found in wheat, barley, and rye. "After the diagnosis is made and the patient starts a gluten-free diet, we expect to see recovery of the villi," said Peter Green, MD, professor of medicine and director of the Celiac Disease Center at Columbia University Medical Center, a gastroenterologist at NewYork-Presbyterian/Columbia, and a co-author of the study. "Physicians and patients alike see healing as a goal, but until now there was no confirmed link between healing on intestinal biopsy and clinical risk factors." "We have known for many years that patients with celiac disease have an increased risk of lymphoma, but we did not know whether intestinal healing and its timing affect that risk," said first author Benjamin Lebwohl, MD, MS, assistant professor of epidemiology at the Mailman School of Public Health and a gastroenterologist at NewYork-Presbyterian/Columbia. "Our study shows that celiac patients with persistent villous atrophy—as seen on follow-up biopsy—have an increased risk of lymphoma, while those with healed intestines have a risk that is significantly lower, approaching that of the general population." "Guidelines about routine follow-up biopsy are inconclusive, but this study may convince physicians that the follow-up biopsy can carry important prognostic information," said Lebwohl. One reason this link was not previously seen was a lack of data on the broad spectrum of patients with celiac disease, rather than just those seeking specialized care. Over the past decade, Jonas Ludvigsson, MD, PhD, a pediatrician and professor of clinical epidemiology at the Karolinska Institutet in Stockholm, established a large population-based database using biopsy results from 28 pathology departments in Sweden. "It is only now that we are able to quantify the risk of persistent villous atrophy, which is likely to mirror poor dietary adherence," said Dr. Ludvigsson, senior author of the study. 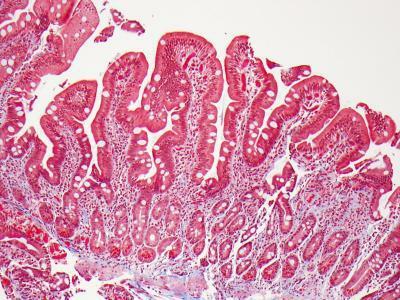 Biopsy of small intestine showing villous atrophy, i.e., flat villi. Image: Govind Bhagat, Columbia University Medical Center. Why some patients heal while others do not is unclear. "We know from prior studies that healing is more likely among patients who report strict adherence to the gluten-free diet, compared with those who admit to less-than-strict dietary habits," said Lebwohl. Since persistent villous damage was seen even in the face of strict dietary adherence, there are likely other, as-yet-unidentified, factors that affect healing. "Our findings linking the follow-up biopsy result to lymphoma risk will lead us to redouble our efforts to better understand intestinal healing and how to achieve it," said Lebwohl. Citation: “Mucosal Healing and Risk for Lymphoproliferative Malignancy in Celiac Disease.” The other contributors are Fredrik Granath, PhD, Anders Ekbom, MD, PhD, and Karin E. Smedby, MD, PhD (Karolinska Institutet); Joseph A. Murray, MD (Mayo Clinic); and Alfred I. Neugut, MD, PhD (Columbia University Medical Center/NY-Presbyterian). Upcoming in the Annals of Internal Medicine, no DOI yet.